Description: It is a large shrub, with dense angular branches that usually end in a sharp spine. Leaves are opposite, short-stalked and thick and grow to about 3 cm long. The plant bears small cream coloured, fragrant flowers in dense terminal bunches almost all through the year. The fruits of the plant are small, pea like and contain many seeds. How to Grow: Mehndi, due to its evergreen dense foliage, makes a good potted plant and can be maintained in pots of 25 to 30 cms size. It can also be grown in the ground where a mature plant needs about 2 sq m space. The plant also makes a nice hedge that can be maintained at heights varying from 1 metre to 2 metres. Care regime: It is a hardy plant and when planted in the ground needs only occasional watering. When grown in pots, watering twice a week is adequate. The plant likes sunlight but can also withstand partial shade for short periods. It also needs periodic pruning to maintain its shape and size. Collection: Leaves can be collected from a three-month-old plant by plucking these with hand or pruned with a pair of scissors. The plant being spiny, care needs to be taken to protect hands from getting pricked. Maintained with care, the plant can continue to yield leaves for many years. 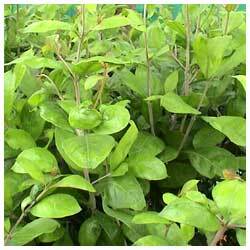 Mature leaves can also be pruned periodically, shade dried and made into powder for future use.